The school has participated in the ‘Open Class of Self-regulated Learning Festival’ organized by the Hong Kong Association of the Heads of Secondary Schools in this academic year. In late October, four classes were opened, including Chinese Language, English Language, Mathematics and Biology, with a total of about 50 teachers joining. Through the lesson preparation, in-class observation and professional post-lesson discussions, all teachers, whether observing or teaching, benefited greatly. During the post-lesson discussions, lesson observers gave us a lot of practical suggestions and put forward a lot of constructive feedback to further enhance our lessons. One of the observers praised our Non-Chinese speaking students for their active participation in class, which she had never seen before! In addition, many observers appreciated our school’s e-learning development, including the supply of mobile devices, use of educational apps, interactive classroom design and ubiquitous learning. ‘Self-regulated Learning’ is the major concern of our school. We are devoted to nurture our students to become ‘Self-regulated Learners’. We are looking forward to more opportunities to open our classrooms, and exchange professional ideas with the industry so that our learning and teaching effectiveness can be further enhanced, and our students can excel academically. This is the third year since our launch of different sports and arts seed projects. The seed projects not only nourish talents of students in primary schools, promote sports and arts, but also provide a ‘through-train’ mode for students who are promoted to our school to further develop their talents. Over the years, our basketball teams have great achievements and the seed project is one of the successful factors, which effectively provides valuable opportunities for the outstanding primary school athletes to engage in high-quality training in our school and participate in high-standard secondary school basketball competitions. We are looking forward to seeing that this strategy can continue to bear rich fruits so that more talented athletes and artists can unleash their potentials and shine. In addition to excellent skills, successful athletes must have strong physiques and will power. 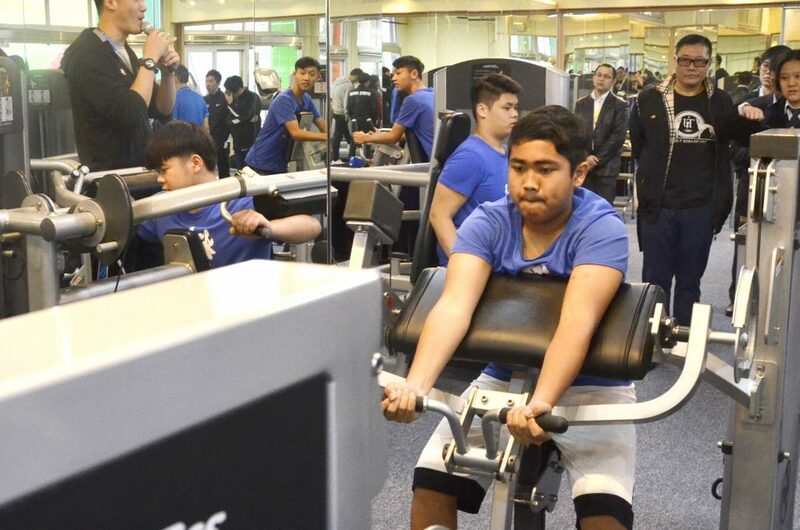 In line with the development of basketball, the school has established the ‘Wah Shan Sports Science Room’, which is a purpose-built facility of 1,000 square feet. It is located on the ground floor beside the basketball court, and is equipped with lots of functional training equipment. This facility aims to increase the overall muscular strength and cardiovascular fitness of our basketball players. Our school’s three physical education teachers have already received systematic fitness coach training to run the new workout area. They have mastered muscle and strength training as well as fitness skills to provide more effective training for our athletes. In order to cultivate students’ artistic accomplishments, our school makes great effort in boosting the development of harmonica art. Apart from the harmonica seed project, the school will set up ‘Wah Shan Stage’ for students to introduce harmonica band performances, organize the Wah Shan Harmonica Ensemble, the Harmonica Festival and other activities, which will enable students to recognize and appreciate harmonica art. The famous ‘harmonica quartet’ Veloz performed in our school on 31st January. They played, danced and interacted well with the audience. Teachers and students all enjoyed the performance. This event was a wonderful page of the development of harmonica art. Furthermore, our school is going to organize the ‘1st Hong Kong Primary School Harmonica Competition’ in July, hoping that harmonica lovers from different districts all over Hong Kong can get together, learn from each other and endeavor in the development of harmonica art. ‘Old Master Q’ is not only a collective memory of Hong Kong people and leisure reading materials for students, but also an excellent teaching material for Chinese idioms. This year, our school uses the ‘Old Master Q’ comic books to teach students Chinese idioms. Many students can even make use of these Chinese idioms in their daily conversation. This shows the effectiveness of learning Chinese idioms through ‘Old Master Q’. ‘Old Master Q’ is also the theme of the annual drama on 3rd March. Both local students and Non-Chinese Speaking students seized the opportunity of using Chinese idioms on stage. Through the drama show, students understood Chinese culture better and further enhanced their Chinese proficiency. At the performance, all actors and actresses performed outstandingly in the drama and they were given a big round of applause. Lastly, I am very grateful to parents and students of Primary 6 for their trust. The number of applications received in the stage of Discretionary Places (DP) this year broke the records of the past 10 years. The number of enrollments has surged. Primary 6 students who came for interview on 3rd February were all well-prepared and confident, striving to secure a place in our school in the first phase! It is all because of the grace of God and the efforts of all colleagues that our school can be so popular. We would like to give all glory to God!